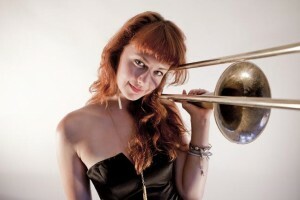 Trombone player, composer, and vocalist Natalie Cressman has captivated audiences with her natural ability to meld her diverse background with her career. Natalie has merged her talent and jazz skills with her seemingly flawless storytelling ability. Natalie’s unique performance will entrance you and leave you wanting more. The Music Appreciation Society is proud to welcome Natalie to the Baur’s on Sunday, August 2nd at 8 PM. Her latest album Turn the Sea portrays a unique yet accessible sound that audiences of indie, jazz, and Latin-groove based music can enjoy. Natalie’s distinctive ability to take on audiences in a relevant light can be partially attributed to her time spent touring with jam band pioneer Trey Anastasio who introduced her to the Jazz world, and Cressman grabbed the opportunity by the horns. Natalie’s musical youth was spent in San Francisco, CA. Her mother and jazz vocalist, Sandy Cressman, introduced Brazilian music to Cressman, while her father and veteran of the legendary band Santana, Jeff Cressman taught her Trombone. In 2009, she attended the Manhattan School of Music, and in 2010 she toured with Trey Anastasio. “I first met Natalie when she was 18, and I was instantly floored by how melodically and naturally she played and sang. Natalie is the rarest of musicians. Born into a musical family and raised in a home filled with the sounds of Brazilian music, Jazz, and Afro-Cuban rhythms, she is seeping with innate musicality. Musicality is in her DNA,” says Trey Anastasio. She has played with Latin Jazz, Latin-rhythm, and Avant-Garde Jazz musicians such as Eduardo Cambone Orquesta Candela, Jai Uttal and the Pagan Love Orchestra, and Peter Apfelbaum. Presently, early 20-year-old Cressman works with The New York Hieroglyphics and Sparkler, both Apfelbaum’s ensembles. Natalie’s first album (Unfolding) is best described as the brightly lit beacon of her originality as, “The mix of Cressman’s confident voice, tart trombone and crack songwriting establishes the artist well down the road from an already fully-established sound on Unfolding.” (allaboutjazz.com). Baur’s Listening Lounge is proud to present one of the most eclectic voices and original songstresses in the music scene in Denver for th first time. You will be swayed by Cressman’s synthesis of vocals and melding of indie music, Latin-Jazz-and Avant-Garde groove . Get Inside The Music with Natalie Cressman Sunday, August 2nd.